The Flowing Well: Drawing Daily From The Living Water: God Has Plans For You! 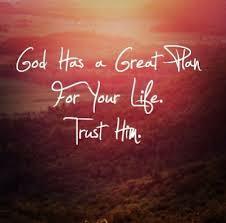 Romans 8:28 - "We are assured and know that (God being a partner in their labor, all things work together and are fitting into a plan) for good to and for those who love God and are called according to (His) design and purpose". God, being the grand designer that He is, has a plan and purpose for everything He created. Therefore that tells us, that we were born (created) because God has a plan and purpose for our lives. Your present circumstances may be screaming out, "Has God forgotten me"? I assure you that there is nothing concerning your present situation that He is not aware of. You are only able to see the "pieces" of your situation, (today) but God sees the Past, Present, and Future of your life. He has not turned away from you. Your part is to keep your eyes on Christ, the creator, and not turn away from Him during troubling, painful times. 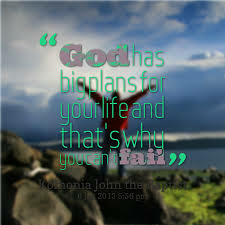 He has a plan for your life that far exceeds your expectations! God Will Not Fail to Come Through For You!